Alittlemarket.com and its community of creators from Aquitaine mobilise to support Imagine for Margo. 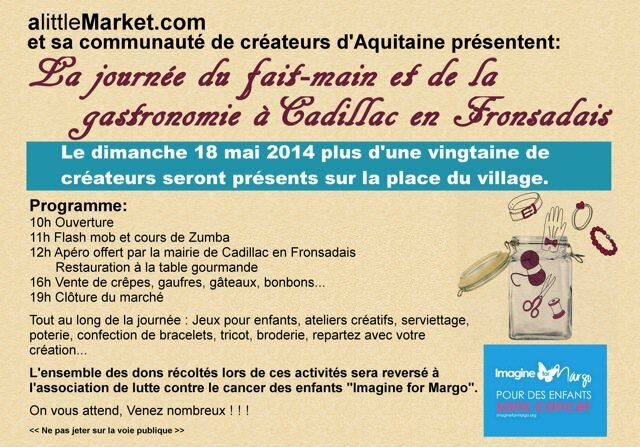 Come in numbers on Sunday May 18, 2014, for the Day of the Handmade and Gastronomy, at Cadillac en Fronsadais. In the program, we have a flash mob, Zumba lessons, creative workshops, knitting, embroidery, and many other activities. The full amount of donations gathered thanks to this Day will be donated to Imagine for Margo. A big THANK YOU to Agnès and her volunteers for this beautiful initiative.